Dr Siti Mazidah Haji Mohamad is a Lecturer at Universiti Brunei Darussalam. She graduated from Durham University (PhD in Human Geography) in 2015. Her main research interest lies at the intersection of geography, media and communication studies. Currently, her research centres on youth's everyday social mobilities and practices and their social realities reflected through various new social media platforms. Within this research area, she has studied: mediated Muslim cosmopolitanism; online privacy in the context of young Bruneians’ self-disclosure on social media; the rise of social media influencers afforded by digital technologies and their influence on Muslim women’s hijab consumption; Muslims performance of religiosity on social media in the framework of lived Islam; and Brunei’s young Muslims 'Generation M' expression of identity on Instagram and YouTube. 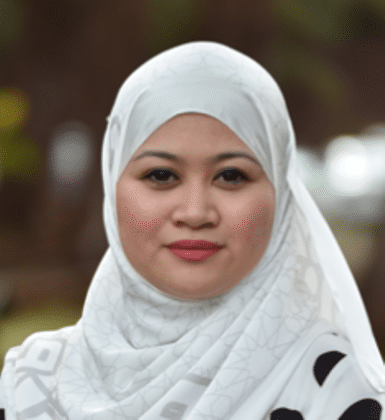 She has a special interest in Affect theory and youth mobilities and is currently leading a funded research on Muslim Bruneian youth's’ self-branding practices on Instagram to explore their mobilities of different forms. She is currently preparing to embark on another youth-focused project: Youth Mobilities in Southeast Asia. 2006 BA Geography (Major Geography/Minor Anthropology). Universiti Brunei Darussalam. 2007 MSc Geographical Information Systems. Leeds, United Kingdom. 2015 PhD Human Geography. Durham University, United Kingdom. 3) Youth Mobilities in Southeast Asia. 1. Ahsan Ullah et al (forthcoming, June 2019) Global Skill Deficiency: Perspectives of Skill Mobility in Southeast Asian Countries. Asian Education and Development Studies. 3. Shafi Noor Islam and Siti Mazidah Haji Mohamad (Forthcoming) Brunei Profile. The Belt and Road Book Chapter Project. 7. Siti Mazidah Haji Mohamad (2017). Performance of Religiosity on a ‘Techno-Religious’ Space. Advanced Science Letters. Vol. 23. Issue 5. 8. Crang, M. & Haji Mohamad, Siti Mazidah (2016). Researching virtual communities. In: Clifford, N., Cope, M., French, S. & Gillespie, T. Key Methods in Geography. London. Sage. 1. Siti Mazidah Mohamad. The New Malay 2.0? Revisiting New Malay in the context of Everyday Cosmopolitanism. JMBRAS (Status - Under review). 2. Siti Mazidah Haji Mohamad and Nurzihan Hassim. Hijabi Celebrification on Instagram : A Comparative study of Brunei and Malaysia. Celebrity Studies (Status - Revise and Resubmit). 3 Siti Mazidah Haji Mohamad. Mobile Youth: Self-Branding and Self-Promotion on Instagram. Digital Asia in Transaction (Status - Submitted). 4. Siti Mazidah Haji Mohamad and Khairunnisa Ibrahim (20XX). Hijab and the Media: Consumption, Representation and Identity. (Status - Re-writing). - Output from unfunded research project with the same title conducted between August 2016 - April 2017. Title: Miscarriage and Still Birth: Bruneian Women Pregnancy Loss Experiences, Coping Strategies and Supporting Role of Health Care Professionals. Offers consultancy on young people's use of new social media.